In Indonesia we are used to clubs moving around the country, changing name, changing city, changing time zone. The most famous of course is Pelita Jaya. Formerly based in Jakarta a series of linguistic and geographic gymnastics have left them now in Madura. Off the radar perhaps but Persires from Divisi Utama have also done their bit for inter island travel. Originally from Rengat in Indragiri Hulu, Sumatra, they have moved to Bali, Banjanegara, Cirebon, Kuningan and most recently Sukoharjo. For this coming season they are back in Sumatra albeit a mere 850 kilometres to the south of their original homebase. Oh, and they have changed their name as well to celebrate their new start. Former Indonesia international Nova Arianto is taking charge of the team now known as Lampung Sakti. Lampung is not the only city to have a new team. Pro Duta are serial movers themselves. They started life in Bandung and have since played in Sleman, Cirebon, Medan and Deli Sedang in their bid for a home base. Now they are back in Java playing in Sragen with a new name,,,Produta Sragen. I am not sure of this is a new team or a merger with local side PSISra. I must admit I have never known anything about Bintang Jaya Asahan except they come from Sumatra. Came from Sumatra. They have moved to the island of batam which lies a short ferry ride from Singapore and will be known as 757 Kepri Jaya for the new campaign. Not sure where the 757 comes from, I don't think they are sponsored by an aircraft manufacturer, but they are certainly ambitious having appointed Jaino Matos as coached and recruiting former international Supriyono to add experience. Singapore fans spoilt for choice? Johor Darul Ta'zim to the north, 757 Kepri Jaya to the south and the premier league live in the food courts! Oh yeah, Sleague starts this weekend as well. Meanwhile spare a thought for North Sulawesi. When I started Jakarta Casual the area boasted Persma, Persimin and Persibom. Latterly we have had Persigo. 2017 will see no representatives as Persigo have been put away in cardboard boxes and will only be opened up when they reach their new home in East Java where they will have a brand spanking new name, Semeru Way FC, based in Lumajang. Other mergers or relocations are on the cards with Persema, back in football after seeing their PSSI ban lifted, keen to find a way into Liga 2 without going the old fashioned way of winning promotion. They have apparently been in talks with Central Sulawesi side Persbul. These are interesting times for Indonesian football. The lack of tobacco sponsorship and local government funds means clubs have had to get creative about funding themselves. Some have essentially taken gap years while they await a sugar daddy while others have sought markets with bigger fan bases and also with smaller travel costs involved. It is interesting that clubs like Persigo and Pro Duta have targeted the heavily populated island of Java and perhaps they may take heed from the experiences of Persires. They struggled to build a support base in their various guises over recent years perhaps because they were seen as a team from outside. Surely if you live in Cirebon you want to support a Cirebon team, not one from hundreds of miles away renting your stadium? Ties to be played at Manahan Stadium, Solo. No extra time, if ties are level after 90 minutes games will go straight to penalty shoot outs. Book promotion is in full swing with a number of interviews either completed or in the pipeline. 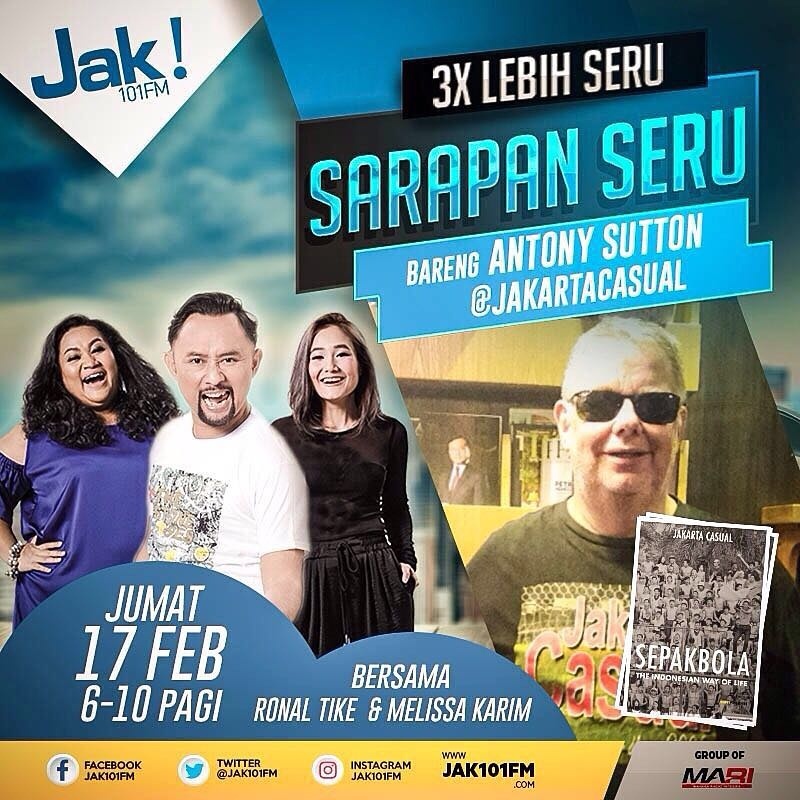 So far we've had chats with CNN Indonesia, Bola,com, Tirto, Indosport, Jak101FM, Juara.net, KRJogja, Goal.com, Kumparan, Media Indonesia and this week promises even more appearances. Now seems a good opportunity to offer up sincere thanks to three people without who etc etc. Syakib who has handled the technical aspects of getting a book from a writer's idea into people's hands. Yusuf Andibachtiar who bravely offered to translate my ramblings into Bahasa Indonesia and managing to keep the flavour of the original meaning. He has also drawn on his extensive media connections to get the word out there. Yeap, this strange foreign guy not only watches football, he enjoys it and has written about it. And my wife...so patient...so supportive. This was an exceedingly tight group. It produced some exciting games, who can forget Mitra Kukar coming back from 3-0 down against the hosts, as well as the largest crowds with an average of 28,000 watching each match day. PSS can consider themselves unlucky to go out but they fought bravely and now have the Piala Digantara to look forward to. Disappointing for the hosts to finish bottom of their group as they begin life after Indra Sjafri. Pusamania under Ricky Nelson scored one goal in 270 minutes but that was enough to secure a spot in the semi finals. After a fourth straight loss, this time at home to Sarawak, Penang fans kicked off outside their Batu Kawan Stadium. So far this season they have complained about their goalkeeper, their kit and their performances. Saturday's protest seemed aimed at the guy in charge of the Penang Football Association. The Penang fans have yet to see their team score this season and they remain rooted to the bottom of the table after four games with zero points one point behind Melaka United. They also turned on new signing Australian midfielder Diogo Ferreira with one fan describing him as a reject. The 27 year old had a good season for Persib last year but it seems the Penang support have no patience. The situation at the club isn't helped by the fact coach Ashley Westwood is having to sit out a number of games following a recent ban. For the man who led Bengaluru to such success in India life in Malaysia on the tropical isle is proving to be a steep learning curve. Malaysian football doesn't do patience with owners passionate believers in gardening leave for underperforming coaches and we have already seen Johor Darul Ta'zim and Felda United say adios to their coaches. The football map has sure changed in the 11 years I have been doing Jakarta Casual. A league dominated by city/district football associations is slowly morphing into an all together more professional set up with private money funding a newer breed of club. Football has had to adapt to a number of structural changes most importantly the banning of tobacco sponsorship and the inability now of local governments to fund their local teams. In 2006 Persik won the Liga Indonesia, their second title in a short period of time. PSIS, Persekabpas and Persimin all reached the play offs that season. Today both Persik and PSIS find themselves in Liga 2 but Persimin and Persekabpas? Other teams from that season have also fallen on hard times. PSMS. Persitara. Persikota. PSDS. Persibom. PKT Bontang. Deltras. Persiter. Persiwa. Persigi. That's almost half the league clubs from 2006 suffering a fall from grace. We may not like it but one reason for the rise and fall of football clubs is down to politics. Much depends on the support from the local politicians and if they have no interest in the game then the football club suffers. If they are passionate then the converse is true. Over the last couple of weeks I have visited stadiums in Tangerang and Depok that have fallen on hard times. They have been allowed to go to waste through lack of investment. 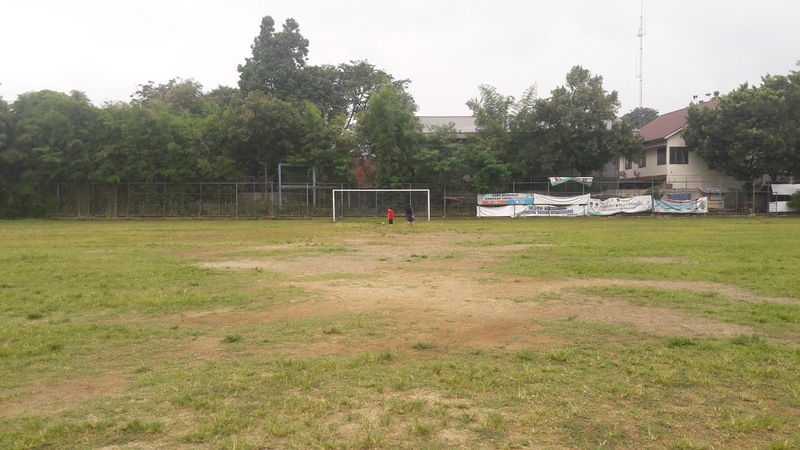 Another stadium suffering a similar fate has been the Pajajaran Stadium in Bogor. Home to PSB. To all intents and purposes PSB have failed to exist during the life time of Jakarta Casual. There has been the occasional appearance in the third or fourth tier but information is hard to find, The last time I recall them, or their stadium, being in the news was when former US president George W Bush landed on the pitch in a helicopter on his way to a meeting. Football clubs belong to their community, at least they used to in England. They still do in Indonesia and as we have seen with the fans of Persebaya in recent years no matter the apathy among those who have the power to make decisions on the ground the football club remains in the hearts and minds of the supporters. So it was last weekend when PSB fans gathered at their team's stadium to carry out some much needed repairs on their fading home ground. It is doubtful they achieved much tangible beyond picking up some rubbish but their efforts showed that for some at least the football club lives on. There may be a Persikabo but they belong to the district of Bogor, a wider geographical construct but for the people who gave up their Sunday to do their bit for their team there is only one team in Bogor. This was a meandering pre season friendly with players still getting to know their teams mates. It didn't need a ref dishing out yellow cards like a broken vending machine. Ten were shown in the game including a second for Persiba's Abdul Rahman. I was at the game and didn't realise he had received his marching orders. Da Silva acored the only goal from the spot on 69 minutes. From my vantage spot it looked like the ref got that right at least. Not a classic but both sides showed they would be among the teams challenging for honours when Liga 1 begins at the end of March. In 2014 when Persib won the Indonesia Super League Montenegran defender Vujovic played a crucial part in their success as this story shows. He has lost none of his knack for netting when needed as he scored the only goal of the game just shy of the hour mark. Looking forward to seeing more of these two teams during the season. Interestingly it wasn't a job hunt carried out in the sports pages so whoever got the job would have had the element of surprise. And the job has gone to...Hans Peter Schaller. Last seen assisting his compatriot Alfred Riedl with the national team at the AFF Suzuki Cup, Schaller is no stranger to the Indonesian leagues having worked with Persiba a few years back. He will watch his new team take on Sriwijaya later today in the President Cup. With a new season set to start in March Liga 2 side Persikad are doing all he right things. They have appointed ex Persija assistant coach Isman Jasulmei as their coach for the campaign and have been busy holding trials as they seek to build a squad fit for the rigours of whatever lies ahead. There is though one cloud on the horizon and it is a pretty big cloud at that. As I discovered when I visited the recently their stadium Merapati Stadium (pictured left), is in a bit of a state. The pitch is threadbare in places and the terraces and stands are in a pretty poor condition as well. Persikad are now worried they may have to relocate. Again. It wasn't that long ago they were playing their home games in Purwakarta after all. History may repeat if the club are unable to get their stadium repaired by whatever deadline there is. So now the club are hoping the local government will help them out with laying a new turf and tidying up the spectator areas. Happier times for Persikad, pictured left away to Persikabo. This was the opening game of the President Cup 2017 and it was so dominated by the visitors the 0-0 would have surprised most. 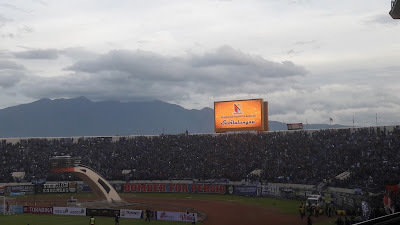 However the man of the match would have been the PSS fans who put on such an impressive display on the terraces everyone from the President of Indonesia to a leading Arema fan website was left purring. It was left to Korean Oh Inkyun to score the first goal of the President Cup in the dying embers of first half injury time The win means Mitra Kukar top Group A with three points. I'm sure you can work the rest out! Two teams with new coaches it was Bhayangkara who blinked first in what is/was ostensibly an East Java derby when I Putu Gede walked after receiving a second yellow on 51 minutes. Within 10 minutes Vizcarra was on the score sheet and Dendi made it 2-0 with 13 minutes remaining. It was a sombre occasion for Arema keeper Kurnia Meiga who wore the number 47 shirt in honour of his elder brother who sadly passed away recently. When these two sides met in the Indonesia Soccer Championship last year more than 29,000 watched the game. 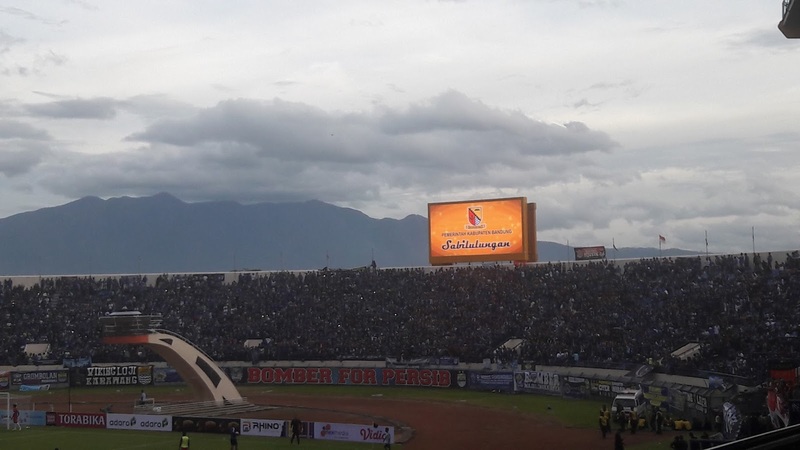 There were less that 25% of that number this time around continuing a trend of falling attendances to hit Arema in recent months. More than a few people have remarked on Persija's lack of numbers up top. They went into this game with Widodo making his debut for the club and Chilean Christopher Arriagada trialling. Widodo scored the winner on 92 minutes against PS TNI fielding foreign players for the first time. Indeed had another debutant Mamadou Barry's effort on 29 minutes not been disallowed by the officials there could have been a very different outcome to the game. As it is Persija are second on goal difference but will surely continue to struggle until they can solve their shortages in the striking department. The following is a translation of my interview I recently did for an Indonesian news website called Tirto. Any mistakes are mine! - Through his book Jakarta Casual wants to introduce Indonesian football to people who may not be aware of it. Jakarta Casual met with Tirto is a shopping mall in South Jakarta. He looked quite comfortable even though he didn't like the cold air from the air conditioning. 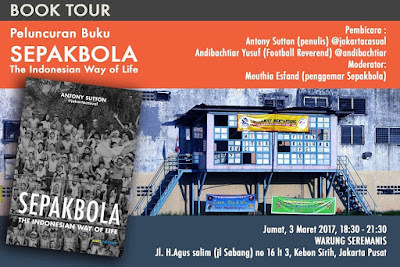 The Englishman will release his first book Sepakbola: The Indonesian Way Of Life on 14th February. With his big, tall body the 52 year old was wearing an Arsenal hat. Judging by the faded colours it looks like he has had the hat for a while! Jakarta Casual has been an Arsenal fan since he was young. He remembers his first game was against West Ham in 1974 (the original says 1973 but it's my story) and even though the game ended 0-0 he has been a fan ever since. From the age of seven he would read any book he could about Arsenal. His favourite players were Liam Brady and Dennis Bergkamp while his father supported Watford. There is one unique thing about him. To learn about Indonesian football he has seen more than 200 games during his 15 years in the country. Not just the top teams but also in the lower leagies like Divisi Utama, Divisi Satu etc. He fell in love with Indonesian football after watching his first game at Lebak Bulus in 2006 when he saw Persija play Sriwijaya. The game wasn't the best but he enjoyed the experience and wanted to see more. In his book he talks about what happens in and around football and feels Indonesia has one unique feature compared to the rest of the region. It is when security officials can walk on the field to stop play when violence on the field or off it gets out of hand. 'FIFA ceases to exist and is replaced by local security forces.' In other countries the referee's word is final. Tradition and history is what sets Indonesian football apart from the rest of the region plus the enthusiasm of the supporters even though Indonesian football isn't that successful. Since when have you been overseas? Since I was born. I was born in Africa, grew up in Germany, Belgium, England. I moved to Australia in 1987 so I have been an expat 30 years. I stayed in Australia three years then had two years in Germany. From Germany to Thailand. Thailand to Bangladesh. Bangladesh to Thailand. Etc etc. When did you come to Indonesia? The first time I came here was 1987. Next was 1991 but I came to live in 2002. Why have you been here so long? I got married here. Been married 11 years this year and have a seven year old son. I was tired with Thailand and had two job offers. One from China and one from Indonesia. China has winters so I came to Indonesia! How long have you liked football? All my life. I used to live in North London near Arsenal. In those days you supported your local team so Arsenal it was. Even though I have been away so long when I do return to England the first thing I do is check the Arsenal fixtures. Then I book flights. It may mean I have to pay more for the tickets but I'm not going all that way to miss the Arsenal! When was the first time you saw a football match? First game was 1973 when my father took me to see Brighton. We had just relocated from Belgium and were staying in the area. The next year I went to the Arsenal for the first time.As I got older if I had the money I would go see the Arsenal. If there was not enough cash then I would go see other games. What makes the English league so good compared to other leagues? You probably think the English league is good but English teams don't win the Champions League and England don't do well at the Euros or the World Cup. I don't think it's that great. So why do you think so many people are attracted to the English league? Because I think the atmosphere and the marketing is so good. The marketing is so much better than Spain or Italy, even Germany. Plus people have known about English football since the 1970s, 80s. Arsenal, Liverpool, Manchester United have been familiar names for about 30 or 40 years. The first time Arsenal came to Indonesia was 1983 so they were already a familiar name. You didn't hear about Barca or Real Madrid then. Plus fans are loyal. For example Arsenal fans. Even though they haven't won much in recent years the fans who joined the local Supporters Clubs 10 years ago are still there and the numbers are growing. Did you watch football in Thailand or Bangladesh? No. Not while I was there. Now though I have seen a few games in Thailand. What is the difference between the Thai and Indonesian leagues? The Thais are still fairly new to football. Before 2009 Thai teams were pretty bad (note; they were exceptions like BEC Tero and KTB but I am talking more about football as a spectacle) so the new teams are quite new. Indonesia has PSM, 1915, Persebaya 1927, Persija 1928, Persib 1933. Indonesia has the history and from that history develops the culture. Ask Persib fans about the time they travelled to Jakarta for a fnal against PSMS in the 1990s and most will have a story to tell. Maybe not their story but from a family member. The Thais don't have that history. Have you met with supporters of all Indonesian teams? No, not all because there are many teams I haven't seen. There are then some questions about individual fans and teams as well as comparing with South America. How about the fighting between supporters? Have you seen Alexis Sanchez? He hates to lose or even draw and he shows this quite visablly. Getting upset is part of football. When a team wins another must lose and we must all be aware of this. Losing doesn't give you a license to get violent. Fans need role models and clubs could be better in this respect. You see club officials attack match officials, players attack officials. Not the best example for young fans in a tinder hot atmosphere. This is one issue that needs to be addressed but it is not for foreigners to solve it. Solutions must come from within the game. Do you get involved in the violence? Never. Not in England and not in Indonesia. I've seen it but I don't get involved, Imagine the headlines if I am pictured kicking off?! Have you faced any problems at games in Indonesia? I think Indonesian people are very friendly. When people see me at games they say 'Hello mister, where are you going?' I reply 'watch the football' in bahasa Indonesia, They're surprised to say the least! Why? Search for Arsenal on Google! Indonesia is the fourth biggest country in the world. It has the best football culture in South East Asia. It has more fans attending games in the lower leagues than some of the 'biggest' clubs in the regions. And no one knows a thing about it! People see Indonesia in the news and it is usually bad. Violence, Natural disasters. Tsunamis. Only negative reporting. When I started Jakarta Casual I wanted to write about a different side of Indonesia. When I started the book I was hoping it would get published in English first. I never thought there would be any demand for it locally. So the original plan was for it to be Indonesian Football 101. I was surprised, and happy, when someone suggested translating it into Indonesian! So it's important the books gets distributed here? Yep because many people don't follow local football, prefering MU etc. When I told my wife I wanted to watch a game she was like 'no way, are you sure?' thinking I was a nutter. But Indonesian football is fun and I want to help tell people it is fun. It's not perfect, of course it isn't but if you want to learn about life, culture even politics then take an in interest! Why doesn't Indonesia have a world class player? Why doesn't England? We give players lots of money, tell them they are world class but they are not. The hype is world class, that's about it. It's not easy to find world class players and in England it is costing us a small fortune to learn that lesson. In Indonesia it is harder because there is little organisation. There are soccer schools here and there and many are excellent. But there is no clear career path for the kids. It really depends who knows about which soccer school. There are areas like Timor which are massively untapped for young players. But clubs are getting more organised and Bali United for example and Pusamania are looking further ahead by opening their own academies. If Indonesia meet Thailand again, will they win? Nope. There needs to be consistency in the national team set up and coaches need to know whatever the age group they will be given time to get results. What do you think of the coaches here? Difficult to answer that. I think more need to follow the example of Rahmad Darmawan, Rudy Eko and go overseas. Jacksen F Tiago has just returned from Malaysia. I think new experiences can be a positive thing for players here. Look at the Thais. The Fream Team of the early 1990s, many players went overseas for the money, experiences and because the local league was poor. Kiatisuk for example. Those players are now influential in the game and Thailand's ambitions are towards the AFC Asian Cup and the World Cup, not the SEA Games or AFF Suzuki Cup. What's most important for you when you watch a game? Supporters usually but they are just one part of the football experience. How many games have you seen and have you seen all the teams? Why are you interested in Divisi Utama? People usually talk about the ISL, why do you watch the lower leagues as well? Have you heard of PSS? Last year they were getting bigger crowds than teams in Thailand, Malaysia. Many weeks they boasted the largest crowds in South East Asia. And they played in Divisi Utama. Buriram United, Muang Thong United, Johor Darul Ta'zim, they are probably the biggest clubs in teh region. And PSS from a suburb in Yogyakarta were getting bigger crowds. So I don't understand why you say people don't care about football outside the ISL. Do you think Indonesia can host the World Cup? No, not yet. The country needs stadiums and it needs infrastructure. Many of the newer stadiums around the country are difficult to reach by public transport. Soreang. Palarang. Bung Tomo. Jakabaring. Investors don't want to build sports facilities, they want to build malls and condominiums. Is your son an Arsenal fan? What would happen if he didn't want to support Arsenal? No problem. Go stay with grandma and grandad. Two goals in a minute by Faris set up the Protectors for a narrow win in Cambodia to take back to Jalan Besar for the second leg next week. Nakamura scored in injury time to have the Cambodian supporters beliving but ex Hougang United striker Plazibat restored the two goal advantage on 70 minutes. Sokngon made it 2-3 with six minutes remaining to set up a nervy ending but Izzdin made it 4-2 two minutes later. South African Shane Booysen made it 3-4 in injury time.